The garden's finished: 18 degrees yesterday morning; no more roses. One more weekend to clean up the remains; then perhaps I can get some writing done. It's Oweynagat, the Cave of the Cat: a good place to stay away from this weekend! No writing over the weekend due to garden prep, but that cold indoor time is coming. A busy day at home, which unfortunately didn't include any writing. Autumn came down like a hammer this morning with a cold front which dropped the temperature 15 degrees in less than an hour. I spent a lot of the day getting the plants into the cold frame and the rosemary into the garage. Also made another batch of plum jam... autumn's here tonight. I'm late today due to several things, not least that I've been doing more work on aldertreebooks.com and also giving out free e-books for my LibraryThing promotion of Flight of the Hawk. 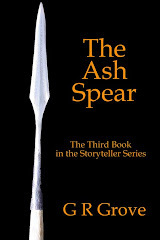 I've also just started a new e-book giveaway there for The Ash Spear. No writing over the weekend: the weather was too good. A few more nights with light frost, but the basil's still surviving. The first stage of garden cleanup is almost done: not much more to do until the cold kills the remaining vegetables. Yesterday I sat on the patio watching the birds at the feeders - four house sparrows, a pair of house finches just starting to show their display colors, and the usually small flock of black caps. The later are fast-moving little birds who dart to a feeder, grab a seed almost without stopping, and fly up into the rowan or elm to eat it; then back again for the next. The house finches, by contrast, settled down on the black seed feeder, one on each perch, and stuffed themselves. When they were through they went one at a time to the nearest water bucket for a drink, then left. Meanwhile I sat and watched and read, sipping a glass of local Gewurztraminer, and sharing peanuts with the squirrels. There was a while in late afternoon when all the lawn mowers were through and it was almost silent. Another beautiful Colorado fall day. Here's a touch of local color: the big ash tree across the street is putting on its usual display. In another week it will be mostly bare, but pure gold while it lasts. No writing so far this weekend, but plenty of garden cleanup. We'll see how this afternoon goes. I had a little frost the last two nights, but now it's warmed up again. Should be a nice weekend, but we have colder weather coming Monday. I need to get some autumn color shots this weekend before it's over - I'll put something up tomorrow. 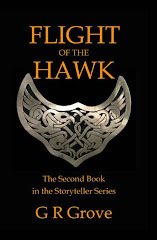 I can't remember if I mentioned it before, but my second e-book giveaway is still running on LibraryThing, this time for Flight of the Hawk. (Go to http://www.librarything.com/er/giveaway/list and scroll down - it should be the second item on the list.) 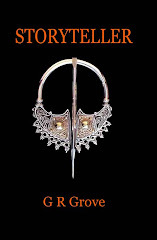 You can also download the first 30% of the book free at Smashwords.com - links on the right sidebar as always. Snow on the mountaintops this morning, and the first touch of frost in my garden. The temperature will rebound into the low 70's by the weekend, but the nights are getting colder -- and longer. I picked the last green tomatoes yesterday before the frost, and the squash and pumpkin vines have finished. Two and a half more weeks until Samhain, and Calan Gaeaf - Winter's beginning in the Celtic year. I got a little more writing done Monday afternoon, sitting in the back yard with my laptop, watching the Blackcapped Chickadees at the feeder and enjoying the orange and purple of the marigolds and asters. Interesting developments in the story, with more to come. Back to the garden cleanup! Not much new here today, other than that the weather has finally become more fall-like. Just another new picture, then... Another shot from Beltany, with sheep. Seems like a long week already - maybe it's the allure of the upcoming three day weekend. Today's picture: part of Beltany stone circle in County Donegal, Ireland. Thinking about stone circles the other day, I started trying to count how many I've visited over the years, and came up with something between 30 and 40. Most of them are listed in Audrey Buhl's A Guide to the Stone Circles of Britain, Ireland and Brittany, an invaluable book for the enthusiast, but I think I've also visited a few small ones shown on the Ordnance Survey maps but not included in his guide. A good few all together, at any rate. The ones that Gwernin has visited, by the way, are all real. First, today's picture. This one, I imagine, needs little introduction: the tour guide called it "the most photographed rock in Ireland." It's the entrance to Newgrange, of course. Why were we in a tour party? Because that's the only way to get admission to Newgrange and Knowth. It's run through the Bru Na Boinne visitor center, and the number of people who can visit during the day is thereby strictly controlled. A much better way of dealing with things than the free-for-all at Stonehenge, in my opinion. Coming early on a wet Wednesday in October, we had no problem getting in. October it is again, but neither wet nor Wednesday. Autumn is cooling down slowly and reluctantly here, but at least the nights are getting colder. Still no frost, and probably not for another week. The squash and the Brandywine tomato are still trying, but the rest of the garden is pretty much done. Biggest gardening accomplishment for the weekend was re-potting the rosemary shrub, which took two of us to accomplish. This is a plant which I grew from a culinary cutting which rooted, and have had for over fifteen years. At this point it's better described as a bush, and bringing it inside for the winter is not done lightly (pun intended!). Fortunately it can stand a mild frost, so I have a little time yet. Not much new on the writing front - hopefully next week end (a three-day one due to the Columbus Day holiday) will be better. Weather is finally cooling off a bit here, though still above seasonal normal. More garden cleanup this weekend, which is good for thinking. It also helps to keep one connected with the seasonal rhythms of the world, which were more important to people in Gwernin's time than to many of us today. An article in the Guardian a couple of weeks ago about the early introduction of pigs into the New Forest to deal with a bumper crop of acorns is an example in point. Traditionally pigs were allowed to graze on acorns this time of year to fatten them for November slaughter. 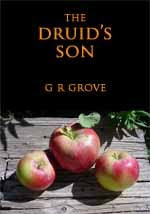 In the Triads of Ireland, "the death of a fat pig" is given as one of the "three deaths that are better than life", and in another Irish text a young man's early death is mourned as that of "a pig who dies before the mast [i.e., acorn crop]". Just an example of the things most of us don't know or think about, but which are relevant to my storytelling.